Earlier this year IRWIN Tools introduced several new products including their new line of Marples Woodworking Series Saw Blades. Marples blades are made in Italy to the highest standards of precision for woodworking and carpentry. 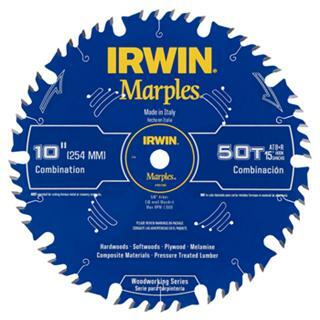 IRWIN Marples blades are specifically designed for extended life, flawless finish and ultimate precision. I’ve been using the new Marples blades in my woodshop for several months and I’m VERY pleased with them. I’ve actually installed them in my large Delta Uni-saw and my Bosch Miter Saw. Both are working beautifully and meet my very high standards for producing very nice accurate and smooth cuts. I plan on testing them longer before I make any decisions about my current blade of choice but right now as it stands these are keeping up with my previous “red” favorite quite nicely. Would you like a chance to win your own 10″ – 50 Tooth Marples Blade? There are THREE different ways to enter this contest and you may enter each option once per household. PLEASE READ THE FOLLOWING DIRECTIONS CAREFULLY! You may enter each one of the following 4 options once per household. PLEASE ONLY LEAVE ONE COMMENT, You can list all your entries and we’ll total them up. PLEASE DO NOT LEAVE Multiple comments. Leave a comment below telling us how you would use the new Marples 10″ 50 Tooth Bade. Facebook – Visit our Facebook Fan Page and LIKE us. Leave a comment on the wall telling us what you think of IRWIN’s new Marples Woodworking Blades. Facebook – Please visit IRWIN’s Facebook Fan Page and LIKE them! Newsletter Sign-Up – One of the best ways to keep up to date with our great giveaways, home improvement advice and tool reviews is signing up for our FREE weekly newsletter. In order to qualify for this entry you MUST sign-up and finish the opt-in process after you receive the welcome email. To sign up follow this LINK. Entries must be received by 11:59 PM EST on October 31, 2012. The winner will be announced on November 1, 2012. Only residents of the U.S. are eligible. One entry per household per each method above for a maximum total of four. Spam entries will not be counted. Spam entries are determined at the sole discretion of Front Steps Media. I’d use it to build a platform for a dolly to create camera movement for a film! I have been coveting these blades since I read a review of them in a magazine publication. I would love to put this in my table saw and use it for boxes with a cross-cut sled. This blade would be fantastic! I have left a comment on Facebook and I am already subscribed to the newsletter. Thanks! I would love to have a set of these blades, my wife and I are planning on some remodeling and installation of some new additions to our house and the new blades would be a huge help. We have lots of home improvement projects we are working on –new saw blade would be very helpful. I pan on using the blade for several projects including railings, cabinets, and flooring. I would use these blades to finish a bookcase. have heard good things about them! Love to have these, outfit both my table and miter saws with the best blades out there! Love to win! Currently I don’t have a project in mind, but as soon as we sell our house and move into a new one I’m sure there will be lots of things planned. Winter will be here soon and I will put the golf clubs away and will be making a lot of sawdust. This will be a great finish blade for my winter projects. Used on Plywood for custom cabinets, building 1 car garage/workshop, on MDF for and American Girl doll christmas present for my niece and other MDF gifts for family. I’d use it to make bunk beds for my kids. My husband could use these for his job as a carpenter. a home, that our son just purchased! I “Like” Irwin Tools on Facebook. I’m attempting to viynl side my house. I’m doing a lot of ripping to pad out the moldings ect… I have a dull Diablo blade on my table saw. A new blade would be very helpfull. I found your site while doing a search for some “how to’s” regarding my porch cieling. Your site is very helpfull so far. Thanks!!! This would be perfect for my miter saw, and using it for cutting the Crown Molding I will be putting up in the house. I would use it on everyday home repairs and any remodeling project I tackle. I am also a newsletter subscriber. I would love to use it in my miter saw for trim jobs, crown molding, and such. I make cabinets and would love to try one of these out in my table saw….. Better yet how about two so I can throw one in my radial arm saw as well! Liked on Facebook and liked Irwin’s on Facebook. I would use it on my Dewalt 10in miter saw. These blades a amazing. No saw marks. I need another so I can get rid of some old ones. We just bought a house so it would be helpful in the DIY home renovation projects. I would use the blades during the remolding of my 1890 folk farm house. I am beginning to make butterfly houses, bird houses, bat houses, etc. for a retirement income. I’ve got a 10″ mitre saw but haven’t been real satisfied with the different makers blades I’ve tried. Would like to try an Irwin blade. Just a few projects going on, and a new blade such as this would be a whole lot better for building custom kitchen cabinets then the one in the table saw now. Cannot wait to get started with the new blade! Did I mention that these will be made out of Hickory? I would use it to build my kitchen cabinets. We are remodeling the house and can use some new saw blades.